The hype around business analytics, our topics in Modules A-F, has reached a fever pitch. From baseball to biomedical advances, stories abound about data scientists applying their wizard like talents to find untapped markets, make millions, or save lives. Data has been described as the new oil, the new soil, the next big thing, and the force behind a new management revolution. Despite the hype, the reality is that many companies still struggle to figure out how to use analytics to take advantage of their data. The experience of managers grappling, sometimes unsuccessfully, with ever-increasing amounts of data and sophisticated analytics is often more the rule than the exception, concludes a new MIT Sloan Management Review study (March, 2016). Competitive advantage with analytics is waning. 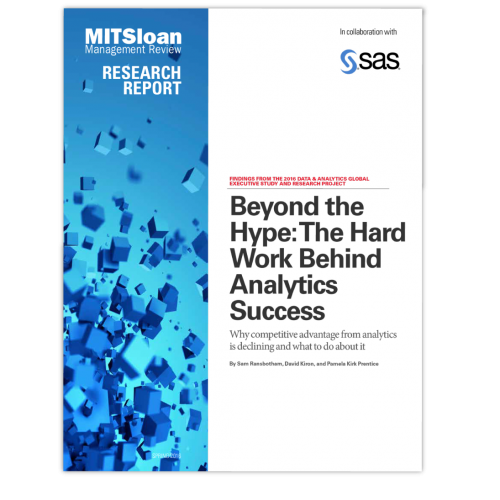 The percentage of companies that report obtaining a competitive advantage with analytics has declined significantly as increased market adoption of analytics levels the playing field and makes it more difficult for companies to keep their edge. Optimism about the potential of analytics remains strong, despite the decline in competitive advantage. Most managers are still quite positive about its potential. They’ve seen increased interest in analytics over the past few years, and they expect its use to continue to grow. Achieving competitive advantage with analytics requires a sustained commitment to changing the role of data in decision making. This commitment touches many organizational aspects, from revamping information management to adapting cultural norms. Companies that are successful with analytics are much more likely to have a strategic plan for analytics, and this plan is usually aligned with the organization’s overall corporate strategy. Most companies are not prepared for the investment and cultural change that are required to achieve sustained success with analytics, including expanding the skill set of managers who use data and broadening the types of decisions influenced by data.